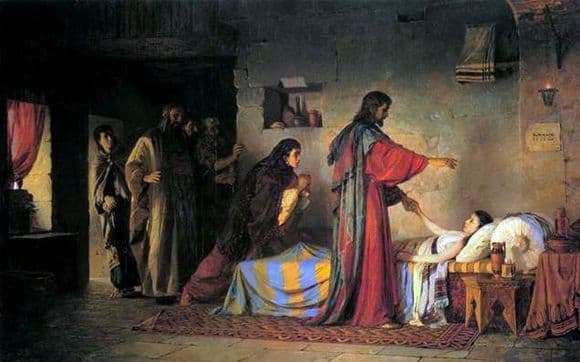 The painting “Resurrection of the Jairus’ Daughter” was created by Polenov in 1871. She was written to participate in the competition held by the Academy of Art and was a contender for the gold medal. At the same time with Polenov, Repin painted a canvas on the same topic, to which critics paid more attention. However, they noted that the picture Polenov looks very vital and in no way inferior to the creation of an opponent in the selection of colors and composition. Also, critics expressed the opinion that the depth of the plot was not fully disclosed by Polenov, since he softened the drama of the picture and portrayed the girl who had already come to life. On the canvas Polenova depicts a company of people, each of whom experiences different feelings and emotions. The revived girl looks beautiful and natural, but the pallor of her face and skin indicates that life has left her body. Christ is represented in the image of a real man rather than a heavenly deity. In his movements can be traced confidence. And, looking at him, a feeling is created – there is nothing beyond his power. From the expressions on the faces of other characters in the picture, it is clear that the miraculous event has happened. Mother is in a state of admiration. She still did not realize her happiness and did not run up to embrace her daughter. A smile and gratitude for justified hopes lit up the face of the father of the resurrected girl. The rest of those present are also shocked and do not believe their eyes. The artist managed to masterfully depict muted daylight and solar reflections on objects in the house and characters, contrasting with darkened areas. The main feature of this picture is in everyday life and naturalness, both draperies and actions depicted on it. This is what impresses the viewer. Looking at the picture, it becomes clear that miracles happen on Earth.